This year, we are delighted to be taking part in the Los Angeles Guitar Festival occurring May 19th in Santa Clarita, CA. 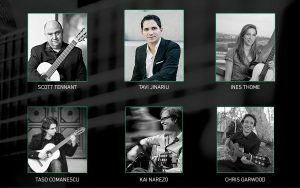 The festival will feature concerts and workshops from world-class artists including Scott Tennant, Taso Comanescu, Ines Thome, Kai Narezo and our very own Chris Garwood. Along with the numerous workshops and concerts, there will also be both Junior and Senior division youth competitions for which the winners will receive a Guitar Salon Studio Series classical guitar. On behalf of the GSI Foundation, Chris will be hosting a workshop on effective practice strategies that help answer the question, “Why Do I Keep Messing Up?” Some of the topics he will cover include setting long and short term goals, making seemingly difficult passages “easy,” and the three pillars of every complete practice session. In addition to Chris’ workshop, the Foundation is also sponsoring 10 students to attend the festival by covering the cost of their tuition. These students come from a budding guitar program in Porterville California, and for many, this festival will be their first time experiencing the larger guitar community outside their classroom. Many thanks to our friends at EliteGuitarist.com for putting together this wonderful event! You can find out more information regarding scheduling and tuition by visiting the festival’s site at LAGuitarFestival.org. We look forward to seeing many of you there!